"Mr. John Naylor (Harlesden), President of the Harlesden and Willesden Photographic Society, was awarded the First Prize, Silver Medal, for his photograph, 'Sunshine and Shadow,' which forms the frontispiece to this issue of the Reporter. 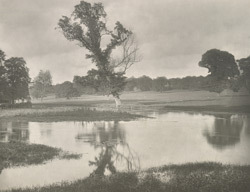 The picture received a silver medal at the Tunbridge Wells Exhibition, at the hands of the judges, Sir David Salomons, Bart., and Messrs H. P. Robinson and Charles W. Hastings. It was taken with a Dallmeyer's W. A. lens, working at f/27.50, and 4 secs. given, in good sunlight, to a Wratten's Instantaneous 12 by 10 plate. The print is platinotype, cold bath." Text by Charles W Hastings, editor of 'The Photographic Societies' Reporter,' 'Amateur Photographer,' 'Photographic Quarterly,' etc.